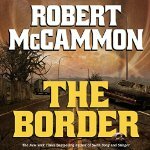 The unabridged audiobook edition of The Border is now available from Audible. The audiobook is read by Fred Berman. A sample can be heard on the Audible product page for The Border. The Audible edition can also be purchased via Amazon US and Amazon UK.